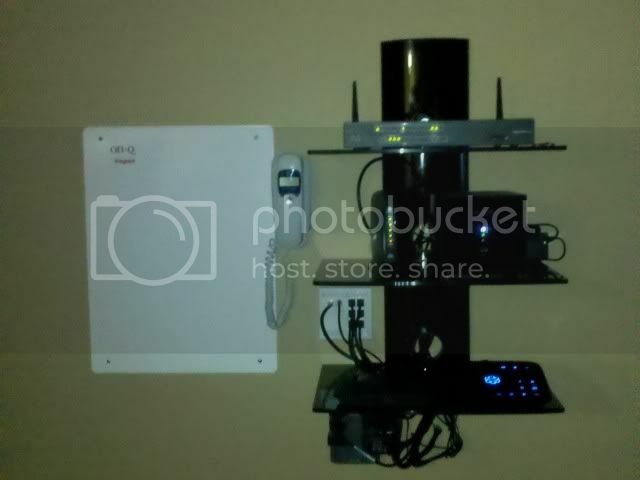 What's on the top shelf and what's to the right of the modem? 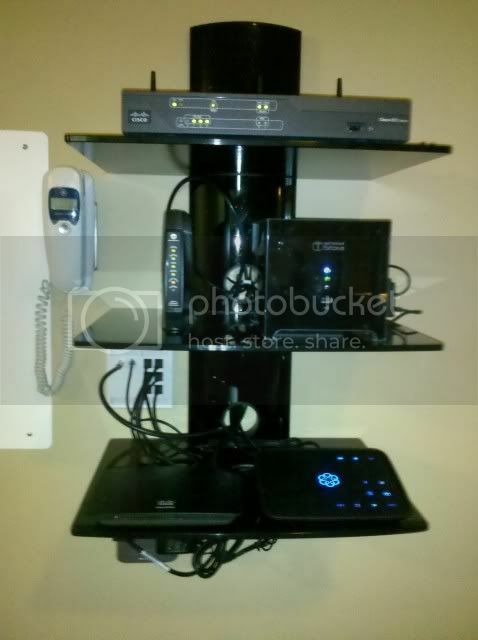 Top shelf is my router, Cisco 881W. To the right of the modem is my Netgear NAS. You can see them a little better in this picture. Sorry my phone does not have the best camera. Wow, your router looks like it can service the whole Pentagon. Well not quite but it is a fairly powerful small business router. A home router wouldn't do what I wanted to do with my home network. Which is what? As is what you want to do with your network. 2. HD streaming at 1080P for at least two simultaneous streams. 3. VoIP (Ooma) while streaming television/movies without interruption. 4. The ability to rate limit other traffic so it does not interfere with video streaming and phone calls. Last edited by FX4 on Wed Mar 07, 2012 5:02 am, edited 1 time in total. That's a lot of work. I have a dual band 300 Mbps per frequency wireless router. 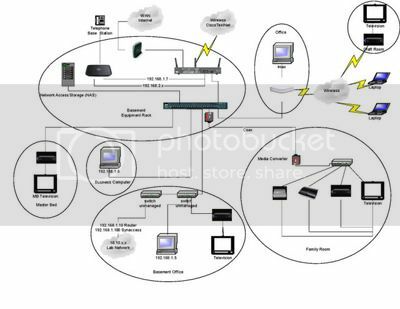 I have 3 laptops, VoIP, apple tv, two directtv boxes that need Internet for vod, three iPods, three mobiles on wifi at times, blue ray. Not all runs at once fortunately but my router seems okay with the traffic it seems. I gave up DirecTV and went to an off air antenna and I use ROKU and PlayOn (as well as a bunch of other IP connected television devices). I have not had success with 1080P and wireless. It seems to do 720P okay but 1080P brings wireless to its knees in my experience.